Wobbly tree with three circular platforms around its trunk. 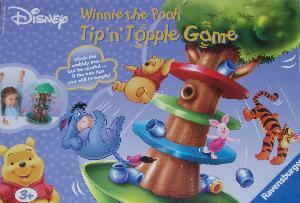 24 plastic playing pieces (4 Winnie the Pooh, 4 Tigger, 4 Piglet, 4 Eeyore & 8 honey pots). Gameplay: The playing pieces are shared out between the players. 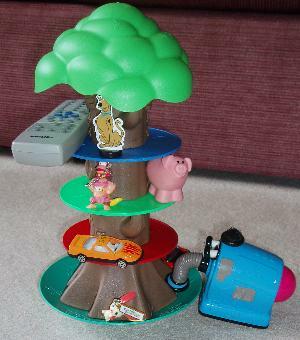 The players take it in turns to roll the dice and put a playing piece of their choice on the tree. The dice determines which platform the piece must be placed on or whether the player can choose freely. 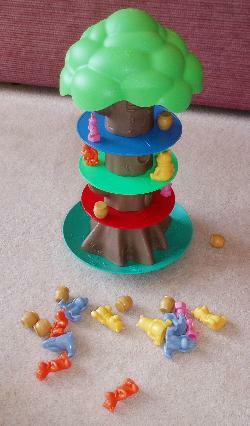 If any pieces fall off the tree during a player's turn, then that player has to keep them. Object: To be the first player to have no playing pieces left. Age: 3+ but any child over five is going to get bored very quickly. Also, a three-year-old playing against older children is almost certain to lose. Tip'n'Topple involves similar skills to Buckaroo!. It's all about concentration and careful movement. It's a lot easier than Buckaroo!, though. If the tree is set up on carpet then it barely wobbles at all. It really needs to be on a hard, flat surface. (The top of the box will do). Even then, as long as everyone's paying attention, it's not difficult to play a whole game without any of the playing pieces falling at all. 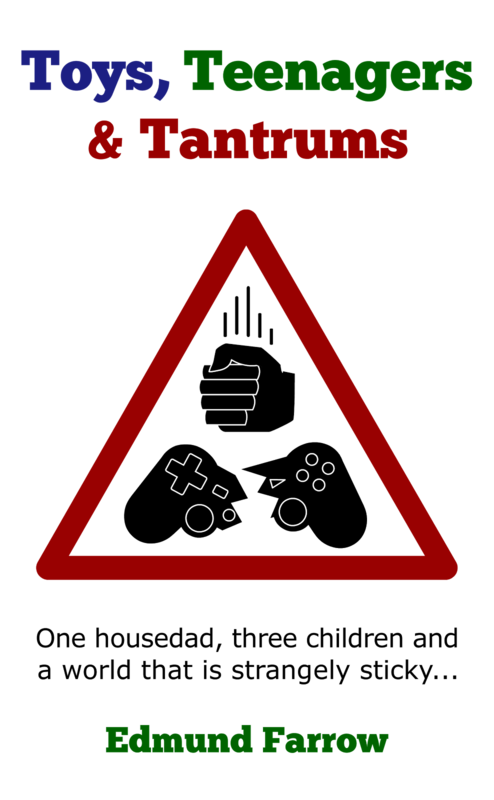 It is good, however, that the game doesn't end cataclysmically if someone does make a mistake. This allows small children to play the game (but makes it fairly dull for those of school age). There are a couple of alternative game options but they only make things more complicated rather than more interesting. I suspect the best way to add longevity is to play the game with different playing pieces, such as other toys, common household items, fragile ornaments and prized family heirlooms. Another possibility might be to wear a blindfold. If you have really good insurance, you could combine the two. Much, much harder than it looks. Conclusion: It's OK but it's more merchandise than game. Its main value is in providing a supply of little plastic Winnie the Pooh figures. Can be used as a playset. Disney version of Winnie the Pooh. Pieces are likely to be played with as toys and scattered to the four corners of the house. Frisk children for concealed Piglets before they leave the room. Thanks, just bought this from a jumble sale for 20p, all the pieces were there but no actual instructions, your review has helped. Glad to be of assistance. 20p is a score just for the figures alone!